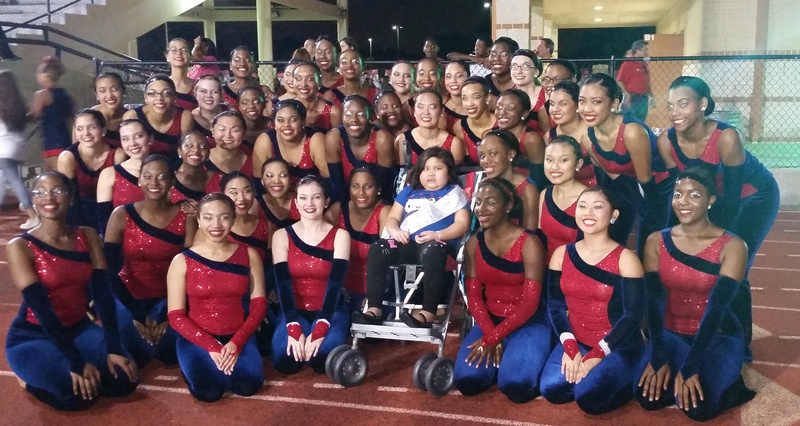 On Friday, September 25th during the Manvel High School vs. Pasadena High School football game, the Manvel Majestics Dance Team honored Mikayla Quindoy, Laura Ingalls Wilder Elementary 2nd grade student, who is currently battling childhood cancer. Mikayla was given the title of honorary Majestic of the Week, in conjunction with the Alvin ISD Hats on Day, and in honor of her strength. Hats On Day encourages students and staff to support others who have previously, or are currently battling childhood cancer. Pictured is Mikayla, center, along with members of the Manvel High School Majestics Dance Team.